Every night from the 22 to the 29 of February 2008, the vapour emissions of he Salmisaari power plant in Helsinki will be illuminated to show the current levels of electricity consumption by local residents. 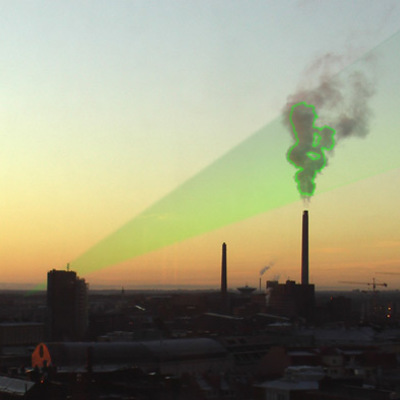 A laser ray will trace the cloud during the night time and turn it into a city scale neon sign.Nuage Vert is a communal event for the area of Ruoholahti, which anticipates esoteric cults centred on energy and transforms an active power plant into a space for art, a living factory. In tandem, as a reversal of conventional roles whereby the post-industrial factory is turned into space for culture, Kaapeli (the cultural factory) becomes the site of operation and Salmisaari (the industrious factory) becomes the site of spectacle. No other space, network, grid, community could better represent a city and it's activity as a whole. The physical dimension of the Salmisaari site, inhabits a special position in Helsinki; physically, visually and metaphorically. The vertical vectors of the architecture connect the underworld with the sky: the underground coal storage tunnels descend to 126m below sea level (the deepest point in Helsinki) whilst it's chimney reaches 155m into the sky with its cloud disappearing into the lower atmosphere. On the horizontal plane, the warm water tubes spread out like veins to heat the homes and offices of Helsinki. Since hot water cannot travel far, the factory is necessarily situated in the city centre, not in the periphery. The factory IS the centre. The extended space, vertically and horizontally, defines the sphere in which people live. In this sphere we are slowly becoming aware of the material and nonmaterial analogy between religion and energy. The factory gives us warmth, it is the provider of comfort and our lives increasingly depend upon it. Energy and religion are both visible and real, they shape our physical environment in the form of the enormous buildings that we build, and yet they are invisible. Since electricity cannot be stored, like religion, it is ephemeral and only exists in the moment of consumption. In February 2008 we will herd around this cathedral of energy and celebrate.